I still have a few things to add but it is so much closer to the finish line now. Whew!! Now I will admit that I find this a great read. You can't help but get caught up in the book, hours pass, nothing has been done in the house... it goes on 1:30 am and the alarm is set for 6:30....yes...it has consumed me, OK there I said it, and today, all I could think of was Christian Grey, honestly?? 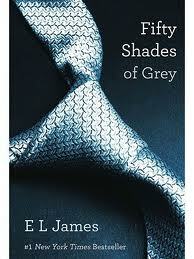 I went through the whole Edward / Jacob thing with the Twilight Series, and now onto Christian Grey? I'm only human, don't judge me...please :) Two days and I need the second book already. It is a trilogy if you haven't heard anything of this book, you can click on the links and check it out. Without the other books, I may just get some stuff done around here, fingers crossed. Hubby returns tomorrow from his annual fishing derby, so hoping for some fresh pickerel for dinner. The sun is shining here and I'm loving my coffee on the deck in the mornings, kids are crazy busy now that June is here, Three-pitch, track and field, class field trips, annual school BBQ. School will be done at the end of June and relaxation can begin. Ugh, I have flowers in my van for the school, I guess tomorrow I should plant those. Oh and my parents return soon from their vacation abroad, I can't wait to see all their pictures, I may need to make a pot of tea for us to sip and chat about all their adventures. Has anyone else read the book, or the trilogy? Thoughts? Any other books of interest?